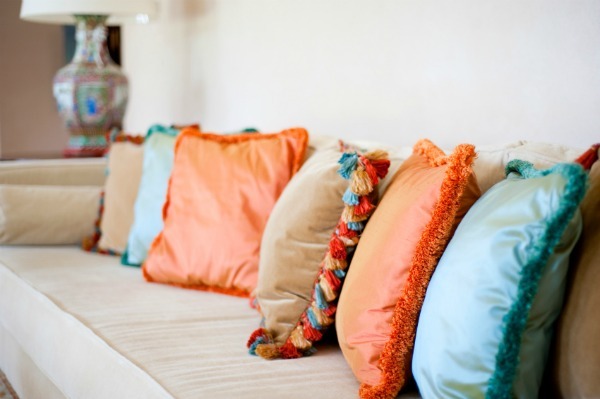 If you want to add a splash of colour to your indoor lounge suite or outdoor deck chairs, follow this simple step-by-step guide to making your own cushions. All you need is a bit of fabric, a few free hours and some inspiration! If you’re going to make a bunch of cushions, think about mixing and matching various colours and patterns, or even playing with different sizes. To save costs, you can even recycle old bedsheets, tablecloths or curtains. Once you have your fabric, you can gather the rest of your materials and start making your cushions! Measure the length and width of your cushion inserts. Sew along the three pinned edges (one centimetre in from the edge), with your sewing machine or by hand-stitching with the needle and thread. Grab the open edge and fold each side back one centimetre so that a tiny strip of the right side of the fabric is showing. Pin into place, then sew all around the edge to form a neat opening. This will prevent the fabric from fraying. Turn the cushion cover inside out and iron. The right sides of the fabric should now be facing outwards. Sew a strip of Velcro onto the inside of the open edge so you can close it to keep out any dust. Alternatively, sew a few buttons or fasteners and hooks along the edge. Push the cushion insert inside and close. Snuggle up with your new cushion and reward yourself with a cup of tea for a job well done! Note: If you have the time and the inclination, add some cute embellishments to your cushions such as button clusters, beads, ribbons or patches of fabric. If you’ve made your cushions for outdoor use, don’t forget to bring them inside before it rains.